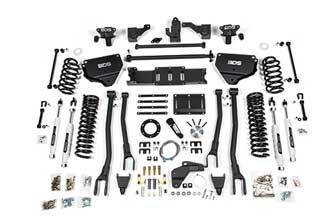 BDS Suspension adds to its industry leading lineup for the late model RAM 2500 4WD trucks with 8" 4-link systems. This new 8" 4-link system offers premium on-road comfort and superior offroad capability for the best all around performance out of your new 3/4-ton RAM trucks. The system converts the factory radius arm suspension to BDS's tried and true 4-link design for improved stability, wheel travel, and handling across all terrains. The 4-link design limits caster change to less than 1-degree of change throughout wheel travel for better handling, steering control, and overall driveability. The heart of the system are a pair of massive frame-mounted brackets precision welded and engineered to position the new upper and lower control arms for optimal suspension geometry for late model RAM trucks. The 4-link brackets are fabricated from 1/4" thick steel and wrap around the frame as well as the factory radius arm brackets to create an extremely sturdy mount for the new arms. Removal of the factory radius arm brackets is not required allowing the brackets to stay intact to speed up the installation time. The upper and lower control arms are built from 2" OD x 3/16" wall DOM tubing for the strength to take any abuse you can throw at them. They utilize large 2.5" OD polyurethane bushings to isolate road vibrations and are formed inward to allow for extra tire clearance. These arms are finished in a durable textured black powder coating and use grease fittings for easy servicing. The additional height comes from a pair of specially designed dual rate ProRide coil springs. These 8" coils have been engineered and tested to improve the ride quality and performance across all terrains while holding up to the rigors that 3/4-ton truck owners demand without bowing or sagging over time. A heavy duty track bar relocation bracket is supplied to recenter the front axle once lifted and a forged drop pitman arm is used to correct steering angles to keep them in phase for proper handling. New extended sway bar links are included to correct the front sway bar operating angle. These new links are greasable via pre-installed grease fittings and feature a unique poly-flex ball design to provide bind-free operation. Extended front bump stops are included to limit suspension compression and braided stainless steel kevlar-lined extended front brake lines allow full droop of the suspension. Rounding out the front are your choice of specially valved NX² series or Fox 2.0 performance gas shocks for a smooth ride across any terrain. At 8" of lift, transmission/transfer case relocation is required to allow front driveshaft functionality. BDS includes a new laser cut transmission crossmember and adjustable transmission mounting plate to increase clearance front driveline clearance. The transfer case is repositioned by way of a supplied indexing ring kit to correct the operating angle and a billet aluminum driveshaft spacer is supplied to allow the use of the factory driveshafts. Indexing rings are available for both 6-bolt and 8-bolt transmission equipped trucks, confirm transmission before ordering. In the rear careful consideration was taken to design the system for load carrying capacity, handling, and ride quality. The factory coil positioning inside the frame rails is sufficient at smaller heights, but at 8" of lift needed to be modified to increased stability. The engineers developed an all new outboard coil spring design that relocates the coil spring position outward 8" on each side (16" total) using a set of bolt-on mounts. This new position mimics that of a leaf spring on the 3500 models and provides increased stability without compromising ride quality. The new upper and lower coil seats locate off of existing features on the frame and axle, requiring only minor drilling for mounting hardware. The new position allows for a much shorter and more stable coil spring design. This virtually eliminates any chance of coil bowing and ensures the coils react predictably throughout the full range of travel. In addition to the coil springs/mounts, a new track bar relocation system is included to properly set the rear roll-center height and center the axle under the vehicle. The rear track bar relocation includes a new heavy duty adjustable track bar. The track bar uses high-durometer polyurethane bushings at the frame and an adjustable forged COM bearing joint at the axle. Extended rear sway bar links round out the rear suspension components. Rounding out the rear of this kit is your choice of NX² series or Fox 2.0 performance gas shocks. BDS has a number of accessories and upgrades available to "Customize this Kit" on our website. Both single and dual steering stabilizer kit are available to meet your on-road and off-road performance needs. Available with NX² series (white body), 9500-series (brushed stainless body), and Fox 2.0 (50/50-valved aluminum body) BDS steering stabilizers improve drivability by reducing front end shimmy caused by oversized tires and mount above the tie-rod for extra protection when offroad. The dual stabilizer kits mount end-to-end with an attractive BDS branded center bracket. In addition to steering stabilizers, BDS offers a heavy duty adjustable front track bar to allow you to dial in the front axle lateral positioning. Constructed from 1-3/8" solid steel stock this new adjustable track bar is built to handle on and off-road abuse and uses a 1-3/8"-12 fine threaded pinch bolt design turnbuckle to allow easy tuning to properly recenter the front axle for a range of lift heights. The track bar is formed for proper clearance around critical front end components and features gusseted ends for additional rigidity. The ends utilize high-durometer polyurethane bushings with thick-walled steel sleeves for strength and reliability. To improve dampening capabilities BDS offers front dual shock mounting brackets. The upper hoop ties into the factory coil bucket and frame rail for added rigidity and allows you run a pair of NX² series or Fox 2.0 shocks at each front corner. 560 Plus 5-year, 100,000 mile Supplimental Drivetrain Warranty is available for this system. Visit 560plus.com for more info. 6. 40x13.50 tires may require some trimming, and depending on wheel width and backspacing may require spacing the front bumper forward and inner fender trimming.